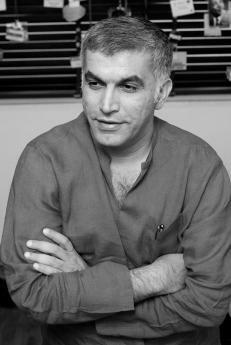 Nabeel Rajab, a prominent rights activist in Bahrain, director of the Bahrain Center for Human Rights, has been arrested over a tweet deemed “denigrating” to the authority. This is not the first time that the man is watched by the government of his country. Rajab has been under the regime’s custody from 2012 until May this year, because of his participation to the demonstrations in 2011. The statement spread by the Interior Ministry to announce his capture does not clarify which is the “faulty” tweet published by Rajab - who has around 240.000 follower on Twitter. According to Manama, the capital of Bahrain, with his words the activist had “insulted official bodies”. The reference is probably to a sentence published on Sunday on Rajab’s Twitter account, where he accused Bahrainis who joined Isis in Syria and Iraq to be members of security agencies belonging to the Gulf monarchy. “Many Bahrain men who joined terrorism & ISIS - said the tweet - came from security institutions and those institutions were the first ideological incubator”. Human Rights Watch strongly condemned Rajab arrest, by saying it is “alarmed that the Bahraini government continues to target prominent human rights defenders in an effort to impede their vital work”. These words are related to the case of another activist, Maryam al-Khawaja, director of the Gulf Centre for Human Rights, arrested on 30 August at Manama airport and charged with assaulting two policewomen. The girl lived in exile in Denmark, but she came back to her country to see her ailing father, dissident Abdulhadi al-Khawaja, who is serving a life sentence and has been on hunger strike since 26 August. In Manama she had collected a warrant of arrest for her campaign against the use of torture in Bahrainis jails and for “insults to the King” - charge that can lead to a sentence of 7 years imprisonment. Is Formula 1 encouraging a brutal crackdown in Bahrain? "it is excess of freedom of expression"